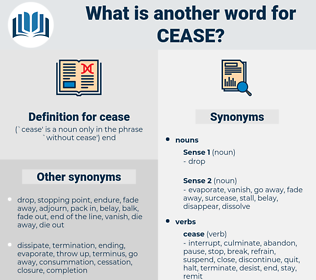 What is another word for cease? stop, halting, interruption, moratorium, moratoria. lay, interrupt, withdraw, disappear, eliminate, renounce, cancel, relinquish, waive, stop, eradicate, lapse, expire, forego, reverse, suppress, abolish, conclude, abstain, forgo, dismiss, remove, continue, curb, vanish, withhold, surrender, slacken, forfeit, depend, adjourn, lose, abdicate, shut, rescind, curtail, complete, freeze, vacate, detain, invalidate, retire, fail, fails, apprehend, dismantle, finalize, stall, eschew, drop, phase, extinguish, supersede, revoke, reject, overcome, lift, abort, dissipate. desist, abandon, refrain, leave, disrupt, forsake. continuation, claim, seek, retain, inaugurate, institute, haunt, initiate, advocate, assert, defend, vindicate, protect, keep, set about, prolongation, favor, court, maintain, adopt, extension, undertake, hold, cherish, persistence, support, prosecute, continuance, pursue, enter upon, originate, occupy. create, persevere, go, keep on, bear, DO, carry on, begin, open, start, restart, commence, complete. But I deny that if peace had come the authority of the Government to protect these people in their possessions would cease the moment it was declared. Catrina looked up when the Frenchman entered, but did not cease playing. pull the plug, withdraw, retire, shut off, break, call it a day, close off, cheese, sign off, call it quits, knock off, drop, leave off.